i) drained tank and both float chambers and put in 10L of fresh 98 octane. ii) replaced front needle and seat (was leaking). iii) cleaned plugs, altho' the BP6HS plugs look nice. It then started and ran only on one cylinder. There was no spark in the front cylinder which turned out to be dead coil. So I fitted a pair of new coils (Fuelmiser CC505, as advised by the local Duke shop which has done some work on the bike; these seem to be a copy of the Bosch GT40T coils formerly on the bike). I'm fairly sure I didn't mix up the wires for the coils. it now has fat blue sparks front and rear, clean plugs, and fuel in both float bowls. It turns over strongly and occasionally fires, no backfiring, but doesn't look like starting and running. I'm reluctant to keep turning it over because I had to replace the starter motor clutch at some expense a couple of years ago. it's electric start only. The guys at the local shop said it needs new carbs, but this shouldn't stop it from starting. It doesn't have chokes or ticklers, so I give the throttle a few twists before trying to start it. If it was me, I'd look at the carbs. You don't need new ones . Just need to clean them, preferably ultrasonically and paying special attention to the drilling that supplies air at tickover; and then rebuild - re-setting float heights, replacing seals etc. The fact that one of the needle valves was leaking is a good indicator that this is overdue. It sounds like the idle and probably the accel pump circuits are clogged. When they sit for a long time with fuel in them the volatile components of the gas evaporate leaving a brownish muck that quickly solidifies and clogs the jets and passages. Removing the mixture screws and spraying through the hole with carb cleaner might clear it but as Craig said, the ideal would be to have them spend time in an ultrasonic cleaner. OK, thanks, I'll get the carbies cleaned. The suggestion about the carbs being clogged sounds about right to me. If it was me, I'd look at the carbs. You don't need new ones . to be fair to my local duke shop, they told me last year that the carbs need replacing, because of wear; it wasn't in response to this failure to start. 1. Slides are getting difficult to find. But check wih Steve. 2. After very high mileages, you may get some wear in the bodies. But, in extremis, even these can be re-sleeved. Steve has pretty good prices for a complete PHM but just a slide is $80. I have no idea how many miles the bike has done. I got it 3 yrs ago and the speedo shows 26,000 miles. Could be any mileage. I'm thinking that I might save myself a lot of trouble just by buying a new pair. Last edited by cooperplace on Mon Nov 06, 2017 1:37 pm, edited 1 time in total. Steve has pretty good prices for a complete PHM but just a slide is $80.<snip> I'm thinking that I might save myself a lot of trouble just by buying a new pair. Yup, I agree that there is a certain logic in that way of thinking . At least you know you're starting off right. Take off the transmission cover and check the pickupcables. Ducati forgot to tell Bosch that they were sitting in oil. The cables are not made for this environment. 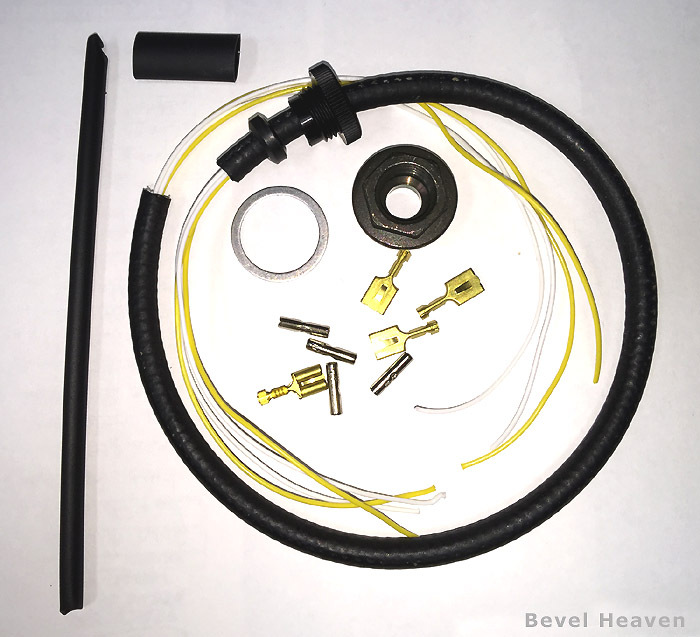 Get good cables and a suitable fuel cable, or buy a kit from Steve. The cables deteriorate after a few years. The cables are not made for this environment <snip>. That said, it's more of a problem with Ducrappis because of the metal debris that's floating about in the oil. This gets attracted by the magnetic field of the pick-ups which leads to short circuit and pick-up failure. I forgot to mention that the heat is also a problem for those cables. Above is the link to buy my kit, below is a photo of the bits.